Normalcy #H365 H365/51, a photo by Jenelle Blevins on Flickr. 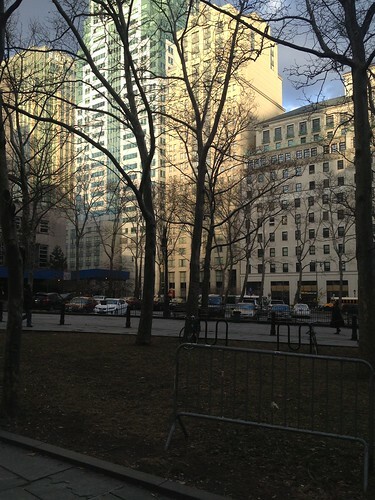 Walking to the bus in downtown Brooklyn. The return to normalcy is here. Brekky #happy365 H365/50, a photo by Jenelle Blevins on Flickr. A little bit if jet lag had us awake at 4am and at Mega Bites by 7.15! 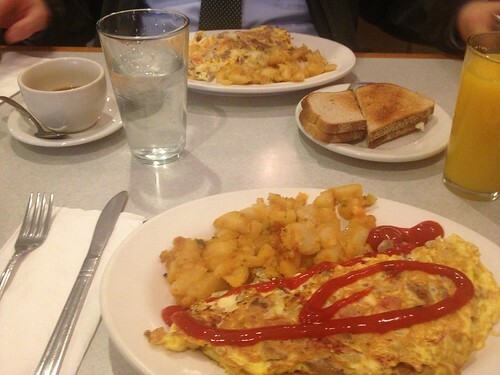 We were both so hungry – omelets and home fries did the trick before our groceries arrived. Also, yes… I am the four year old that still puts ketchup on everything! Arance Rosse #happy365 H365/49, a photo by Jenelle Blevins on Flickr. Other than having a safe flight, It is hard to be happy when a wonderful holiday is over. 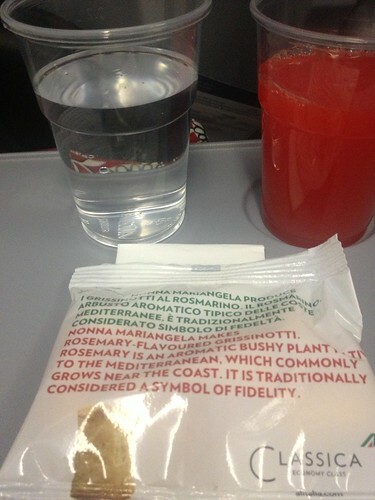 Although, one of the happy aspects of flying Alitalia is unlimited blood orange juice. This stuff is so good! St Peter’s in the light #happy365 H365/48, a photo by Jenelle Blevins on Flickr. Pope Benedict had just finished his Angelus when I took this. St Peter’s was bathed in the noon sunlight while we were in the shaded darkness. The light makes it look like I have just photoshopped St Peter’s in… but it really is standing there! There were over 50,000 people there today all to hear a few words from Papa. They all wanted to say thank you – there were so many signs and tearful people. He is so loved. Bill was just reading an article where a young Italian guy said they went along hoping to change Pope Benedict’s mind. Awwww!! 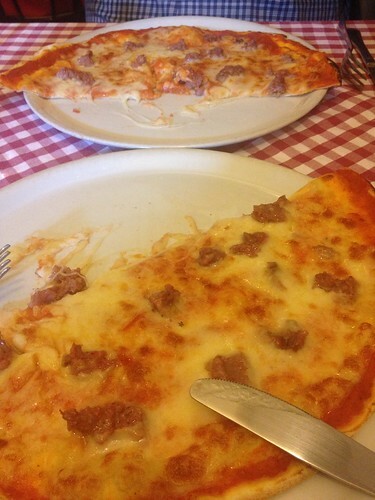 Pizza in Trastevere #happy365 H365/47, a photo by Jenelle Blevins on Flickr. In fact, it was so good we ordered another one after we finished this one. 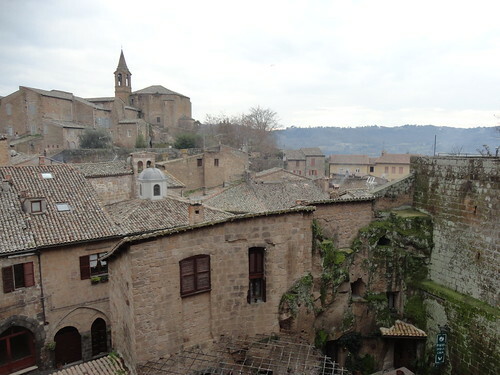 Orvieto #happy365 H365/46, a photo by Jenelle Blevins on Flickr. How could you not be happy when this is your view? Orvieto is beautiful. We had such a wonderful and peaceful day. Ahh Italia! 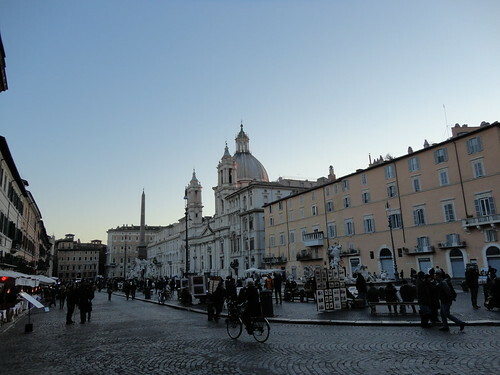 Piazza Navona at dusk #happy365 H365/45, a photo by Jenelle Blevins on Flickr. No filters or editing – this is exactly how dusk tonight looked at Piazza Navona. It almost looks half black and white. I was happy as it was time to head back – my legs were tired. We walked and walked and walked today. Rome makes me so happy and it also makes Bill happy. With that, what a romantic city to be in for Valentine’s Day. The only church we didn’t get to after hours of walking was Basilica of Santa Maria in Cosmedin – where the skull of St Valentine is kept. Spending the day with Pope Benedict #happy365 H365/44, a photo by Jenelle Blevins on Flickr. We left Domus at 7.30, we were in the line for the Papal Audience at 8.00. We were in the hall for the Audience at 8.30. Pope Benedict started his audience at 10:30. We left the hall at about 11:50. By 12.40pm we were back in another line. This time at St Peter’s, where we lined up for the Ash Wednesday Mass. We were at the front of the line. We stood there until 3.30. 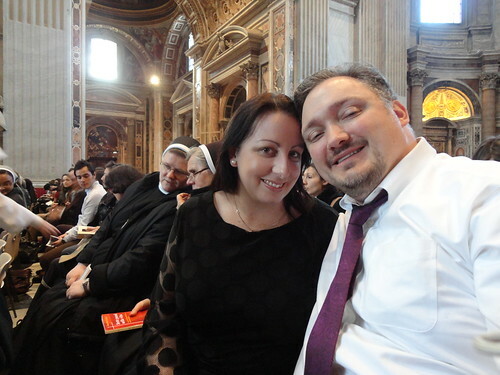 We were sitting in our seats in Basilica by 3.45. Mass started at 5.00. We waved goodbye to our darling Pope at 7:00. We were on the bus by 7:20. As well as exhausted, we feel incredibly blessed beyond what any words can describe. I am so glad we got to experience this together and say goodbye to Papa Benedetto. 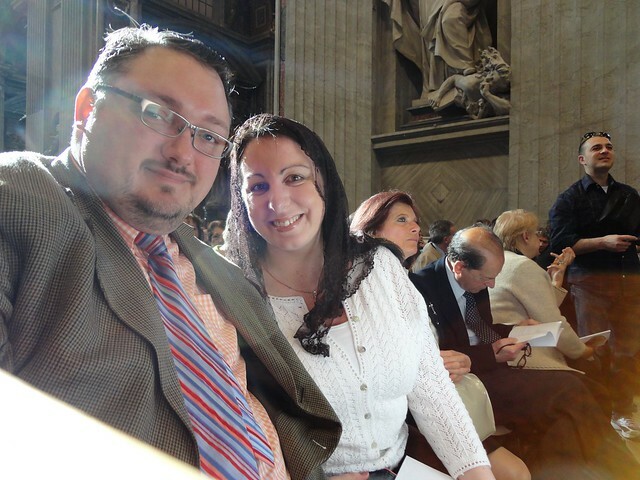 Bill and I attending the Papal Mass last year at St Peter’s. Here is a quick update on tomorrow. 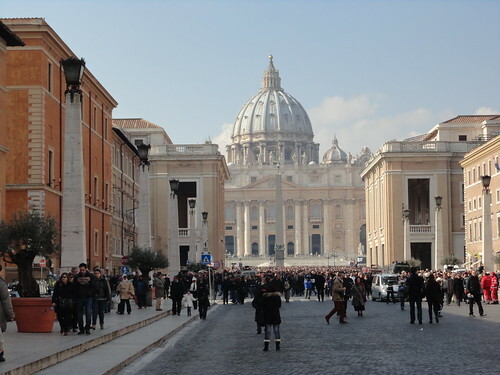 After doing one leg of our pilgrimage tour this morning, it was time to head to St Peter’s. The media were everywhere. We did our Scavi tour (yes… the tour is so good we did it again!) and then ventured outside to go to the ‘bronze doors’ of the Vatican to pick up our tickets for the Ash Wednesday Mass at Santa Sabina. The stone around that area of the colonnade is being repaired so we were pointed to another area.. this time to the secondary post office on the ‘other side’ of the normal Vatican post office. After lining up, we got our tickets. PHEW. We opened the envelope and they were indeed there. All ready for us to take part in such a special time with the Holy Father. We then got on a bus and walked through the narrow streets to go to the US Bishops Office to pick up our general audience tickets. One of the nuns was doing an explanation of where to go tomorrow, especially with all of the crowds. She then said “Now – the Ash Wednesday Mass will be there so you can all start lining up early for that..!” Bill and I looked at each other and let her continue telling us all about it. Bill then waited before saying “You mentioned Mass at St Peter’s… what about Santa Sabina?” That is how we found out that at the last minute, the Vatican has changed the Ash Wednesday Mass from Santa Sabina (a tradition that Blessed Pope John Paul started) to St Peter’s seeing as it is Pope Benedict’s final Mass. 🙁 We are so blessed to be here and while it has been an emotional two days, we now are facing a very different Ash Wednesday than we thought. As a result, we will still be attending the General Audience, but instead of coming back and getting changed into our good ‘Mass clothes’ (I bought over a whole separate outfit and heels for the Mass) we are just going to have to line up straight away for a chance to get into St Peter’s as our Santa Sabina tickets are no longer valid. With another predicted rainstorm tomorrow it is going to be long, soggy, emotional day. Throw in the usual fasting and… what a start to Lent! It has definitely been an interesting time here – we love Rome so much we have even cancelled our side trip to Assisi and Orvieto on Thursday and Friday to spend more time here. It is just magical. Here, everything makes sense. We’re coming back… #happy365 H365/43, a photo by Jenelle Blevins on Flickr. Bill and I tried to do the goofiest expression today while throwing our coin into the Trevi Fountain. 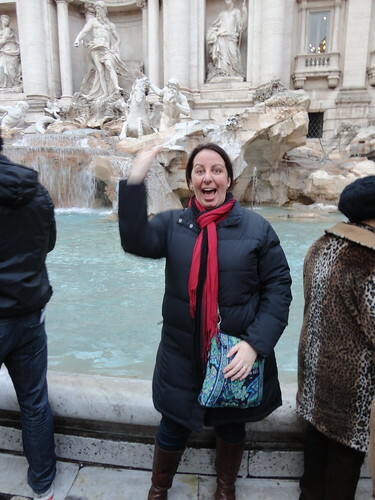 This is the third time I have been to Rome and the third time I have tossed a coin into the fountain. We have to come back. We love it too much here. And yes… I’m holding onto my purse because I’m loopy about the pickpocket stories that you hear about happening to tourists in that area.